The Map link will display a Google map to the class location. The Edit link will start the Class Edit process. 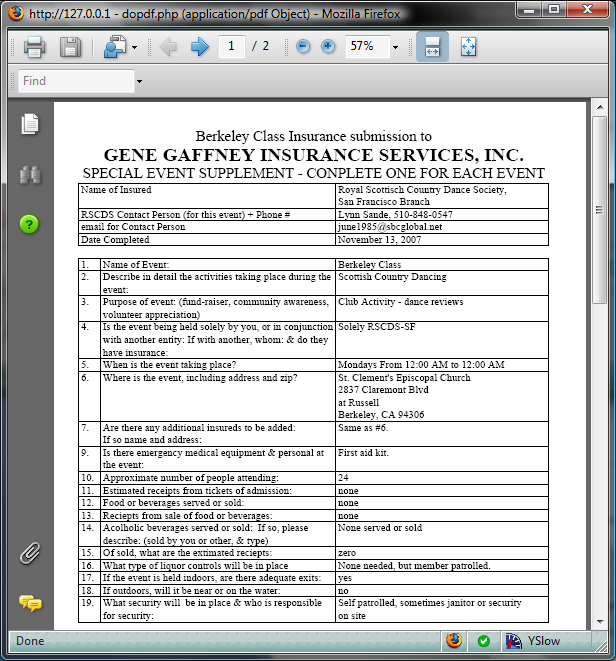 The Open Insurance Form link will display the class information as it is sent to the insurance company and for other uses in the branch. The Edit Membership link will allow the maintenance of the class roster. This is primarily so that user of the website can do a search of members by class. The Delete link will delete the class. Clicking the Edit link will bring up the following form. Required are yellow. Branch Class – most class in the branch. These classes are insured under the Branch Insurance Policy. Affiliate – An Affiliated class is a class that is affiliated with the Branch but is not covered by the Branch Insurance Policy. � An example of this type of class is a class that is run by a city Parks and Recreation department. Branch Demo Team – A Demonstration Team that is covered by the Branch Insurance Policy. At this time, only the New World Dancers are a Branch Demo Team. Affiliated Demo Team – This type of class is a Demonstration Team that insures itself. Dunsmuir Scottish Dancers, Red Thistle Dancers and Santa Rosa Scottish Dancers fall into this category. Sacramento Branch – A class affiliated with the Sacramento Branch. Other Classes – Country Dance classes that don’t fall into the above categories. Branch Step Class – This is a Ladies Step Class that is also a full branch Class and is covered under the Branch Insurance Policy. Affiliated Step Class – This is a Ladies Step Class that is affiliated with the branch but maintains their own finances and insurance or has them maintained for them, such as a city Recreation Center Class. 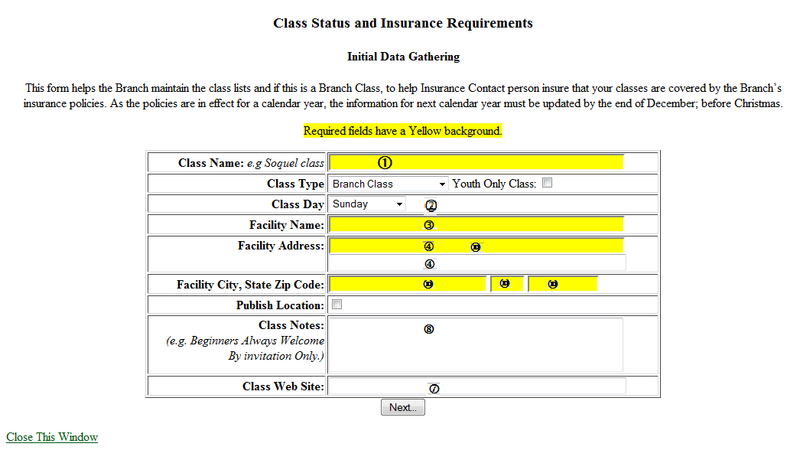 For Branch Classes, when the Next... button is clicked, the following form will be displayed. If an Insurance certificate is required, either a Contact Email address (preferred) or a Certificate FAX number is required. The Facility Contact will be able to specify the endorsements that are required. 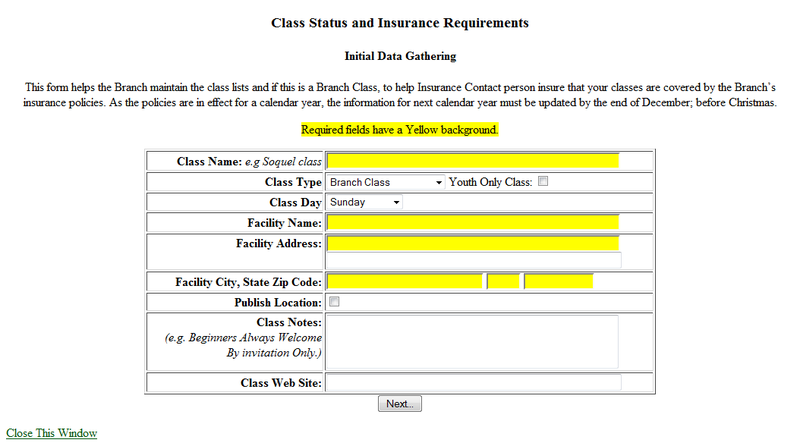 The Class Notes will be included in the Classes page entry and the Class List (Yellow sheet). If the Class Web Site is specifies, a link to the web site will be displayed on the Classes page. When data entry is complete, click the Next… button and the following form will display. 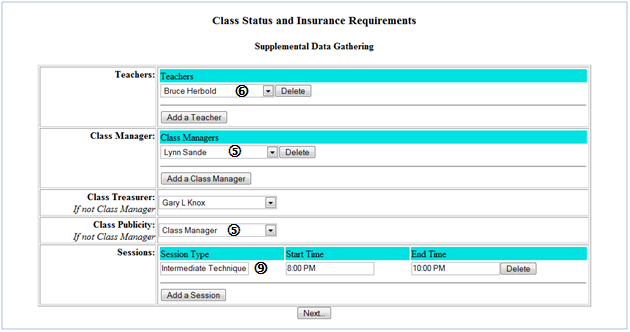 In the Teachers and Class Managers sections the Delete buttons will remove the entry to their immediate left. The Add a Teacher and Add a Class Manager buttons will add an entry. Select the Teacher or Class Manager from the dropdown list. If you have a dedicated Treasurer or Publicity person, select them from the appropriate dropdown list. The Treasurer is treated as a Class Manager but handles the finances for the class. 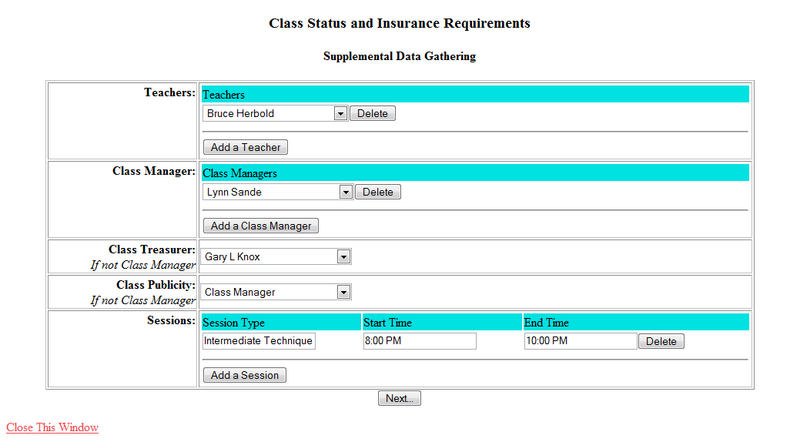 If the Class Manager performs this function, select Class Manager from the list. The Publicity person, if specified will be listed as the Class contact on the Classes page. In the Session area, the Delete button will delete the session to its immediate left and the Add a Session button will add a session. Enter the session type, start time (formatted HH:MM PM) and end time. 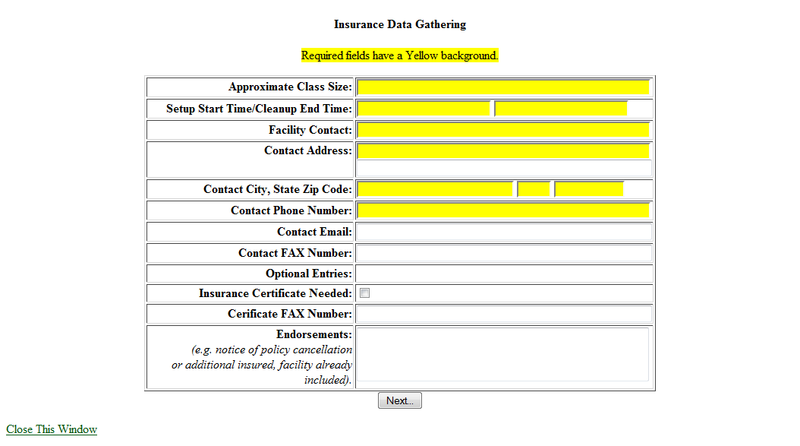 You can view the completed Insurance form by clicking the Show Completed Form button. Clicking the Printer Icon will print a copy of the form, clicking the Diskette Icon will allow you to save a copy of the form. Clicking the Submit Completed Form on the Form Submission Options form will email the form to the appropriate members of the Branch. The name in the dropdown list is not a member of the class. To add a member, find them in the dropdown list (contains only the active members of the branch) and then click the Add button. TO remove a member, click the Delete button by their name. Don’t delete the teachers, class managers, treasurers or publicity members on this form. Use the edit link to handle them. The following screenshot with callouts shows a typical class listing. The Class Name. The definition of a class that the branch uses is a group of sessions that occur at a single location on a single day of the week. A session is where a group of students are taught. All classes with the same name will be grouped together even if they occur on several days or in multiple locations. � See the Berkeley and Livermore Classes. The Day of the week the class is held. If there are multiple classes with the same class name, they are sorted in weekday order from Sunday through Saturday. The Name of the Class Facility. Displayed if specified and the Publish Location checkbox is checked. The Address of the Class. If a second address line is entered, it will be displayed after this address. Note that the city and the state are not displayed as the city is assumed to be part of the Class Name and the State is assumed to be California, for this display. � It’s tradition. Displayed if specified and the Publish Location checkbox is checked. The Class Contact. This is the Publicity Person specified for the class, or if one is not specified, this is a list of the Class Managers. The Teachers of the Class. A web address. This can be an URL for the class web site or to a flyer (as in this example) for the class. Class Sessions. A title and time for each session in the class. The Map link will display if there is a complete address for the class in the database and the Publish Location checkbox is checked. The following screenshots illustrate where the various pieces of information are entered.